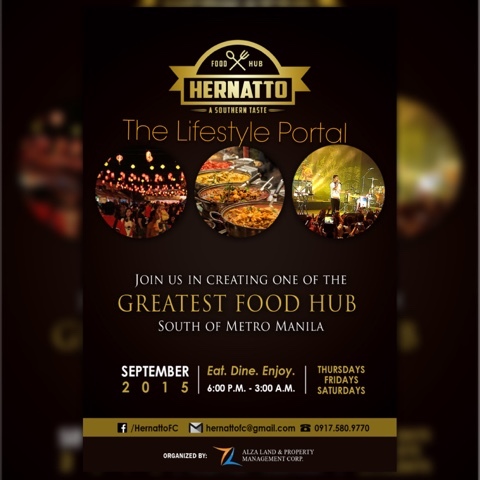 Hernatto Food Food is open every Thursdays, Fridays, and Saturdays of September from 6:00 P.M. – 3:00 A.M., located at H-District in front of SM Southmall, Las Pinas City. This is to cater the growing demands of BPO employees and residents of nearby cities: Paranaque, Muntinlupa, Pasay, and Las Pinas who are looking for a venue where they can Dine, Party, and Enjoy with their friends and family during weekends. Hernatto will also be providing activities such as Food Wars, Best Booth Design Contest, the Next Big Foodtrepreneur, Raffle, Games, and Entertainment. We are now open to accept Concessionaires. If you are a Food Entrepreneur, Restaurant Owners or even a Start-up Business Owners who wants to expand your business; JOIN us now!